In laboratory studies, resveratrol was found to reduce inflammation and have antitumor properties, but studies in cancer patients are quite limited and have not established benefit. A naturally occurring compound in the skin of red grapes and other botanicals, resveratrol has been shown to have anti-inflammatory and antioxidant properties. Some studies suggest it may help symptoms of type 2 diabetes or arthritis. It may also help to protect against thickening of arterial walls and heart disease, but eating a diet rich in resveratrol does not lower the risk of dying from cancer or heart disease. Animal studies suggest that resveratrol may prevent certain cancer cells from dividing, enhance chemotherapy or radiation effects, or protect against radiation side effects. However, human studies are quite limited and have not established benefit. In a group of multiple myeloma patients, a special high-dose formulation actually caused harm and the study was stopped. In addition, resveratrol has hormone-like properties that may stimulate some types of cancer cells. It may also interact with certain drugs. Therefore, larger well-designed trials are needed to determine the conditions under which resveratrol would be safe and effective. There is limited scientific evidence to support this use. A few studies suggest resveratrol may help as an add-on to some medications, but more studies are needed. A few studies suggest resveratrol may improve some markers and symptoms of type 2 diabetes, but it did not appear to improve metabolic syndrome in obese patients. Although one study showed that resveratrol may affect some markers of Alzheimer’s disease, other trials found no significant impact on memory or cognitive function in older adults. Several laboratory studies suggest resveratrol may prevent the growth of cancer cells. However, some of these experiments used very high doses, which in one human study caused serious adverse events. Other studies in humans were too small to draw any conclusions. In addition, resveratrol has hormone-like properties that may stimulate some types of cancer cells. Although a few lab experiments suggest utility, no human studies have been conducted. Given the potential for interactions and hormone-like properties, use of this supplement should be discussed with the treating physician. You have a hormone-sensitive cancer: Resveratrol has hormone-like properties that may stimulate some types of cancer cells. You are taking antiplatelet drugs: In lab studies, resveratrol also has blood-thinning properties, so bleeding risk may increase when used along with blood-thinning drugs. Therefore, use of this supplement should be avoided or discussed with the treating physician. You are taking cytochrome P450 substrate drugs: Resveratrol may increase the risk of side effects of some drugs and make others less effective. You are taking carbamazepine: An herbal supplement rich in resveratrol was found to increase blood levels of this antiepileptic drug in mice. Resveratrol is a polyphenolic compound found in many botanical products. Red wine is a natural source of resveratrol as it is rich in grape skin and seeds. However, resveratrol is usually consumed as a dietary supplement for its purported antioxidant and anti-inflammatory properties. It is also marketed as an anti-aging supplement based on findings that it prolongs the life span of yeast cells (1) (2). This effect has not yet been demonstrated in humans. 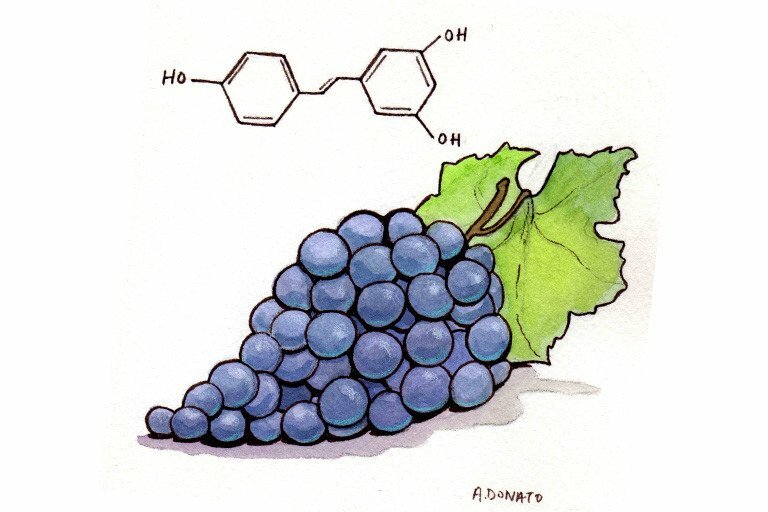 A long-term randomized double-blind trial indicates that resveratrol and its major metabolites penetrate the blood-brain barrier to have effects on some biomarkers associated with Alzheimer’s disease (45), but a meta-analysis did not find any significant effect on memory or cognitive performance (47). Recent double-blind trials have also not found benefit with resveratrol on cognitive function in older adults (52) (53). Resveratrol is also thought to have cardioprotective effects. Earlier studies found it reduces low density lipoprotein (LDL) oxidation, inhibits platelet aggregation, and may protect against atherogenesis (3) (4). Consumption of wine or a resveratrol-rich grape supplement is associated with reduced risk of cardiovascular disease (5) (6) and may help promote circulatory system health (7) (8) (9). However, it does not decrease risk of all-cause mortality in older adults (42). Data on effectiveness of resveratrol against non-alcoholic fatty liver disease are conflicting (44) (48). Resveratrol may increase insulin sensitivity in diabetic patients (10) (11) (43), and supplementation improved arterial stiffness and reduced oxidative stress (50). However, it did not improve metabolic patterns or reduce C-reactive protein (46), and data on whether it controls metabolic syndrome in obese subjects are inconclusive (12) (13). Other studies suggest benefit with resveratrol in diabetic patients on bone density and levels of SIRT-1, a key protein in metabolism and inflammation (54) (55). It may also help as adjunctive therapy to improve symptoms in rheumatoid and osteoarthritis (56) (57). Preclinical experiments suggest that resveratrol has antiproliferative (14) (15) (16) (17) (18) (19) and antioxidant effects (58). In combination with radiation exposure, it exhibited dose-dependent radioprotective (59) (60) (61), radiomodulatory (62), radiosensitizing (63), cytotoxic (64), and neuroprotective (65) effects. Other experiments suggest effects including chemotherapeutic potentiation (66) (67) and protection against chemo-induced cardiotoxicity (20). However, data on use of resveratrol in cancer patients are quite limited. In phase 1 pilots of colorectal cancer patients, one study suggests resveratrol may decrease tumor cell proliferation (41) while another suggests utility may be limited to prevention rather than established cancers (68). Study of a high-dose micronized formula in multiple myeloma patients was stopped due to serious adverse events that included renal failure (69). In addition, resveratrol exhibits estrogen-like properties and activates transcription by both estrogen and androgen receptors that can lead to the stimulation of cancer cell proliferation (18). Therefore, larger well-designed trials are needed to determine the circumstances under which resveratrol might demonstrate utility and safety. Whereas resveratrol appears to be well tolerated in some studies, high doses can cause gastrointestinal side effects such as diarrhea. It also inhibits cytochrome P450 enzymes (22) (23) and may increase the risk of adverse effects of certain drugs. Given its phytoestrogenic properties and potential for interactions, use of this supplement should be discussed with the treating physician. Resveratrol acts as an antioxidant and inhibits oxidation of low density lipoproteins (LDL) (21), platelet aggregation, and eicosanoid synthesis (4); induces nitric oxide (NO) production (24) (25) and increases arterial blood flow (8). These actions may contribute to its purported cardiovascular health benefits. Resveratrol also acts as an anti-inflammatory agent by inhibiting cyclooxygenase (COX) activity (26). It has been shown to decrease C-reactive protein and tumor necrosis factor, and to increase anti-inflammatory interleukin-10 and intercellular adhesion molecule-1 in humans (5). Other effects include decreasing oxidative stress and improving insulin sensitivity by increasing protein kinase activities (10). Resveratrol was also shown to decrease circulating insulin-like growth factor-1 (IGF-I) and IGF-binding protein-3 (IGFBP-3) levels (27) which may account for its anti-diabetic effects in humans. Preliminary data suggest that it increases the life span of yeast cells by activating sirtuins (1) (2), inhibiting human Sirt3 along with stimulating Sirt5 and Sirt1 (28). The neuroprotective effects of resveratrol were shown to be via regulating autophagy and apoptosis mediated by the Akt/mTOR pathway (51). Resveratrol has also been investigated for its anticancer potential. It was found to inhibit proliferation of cancer cells via apoptosis and by exerting anti-estrogenic effects (14) (15) (16) (17). Trans-resveratrol appears to decrease methylation of the tumor suppressor gene RASSF-1alpha in women at increased breast cancer risk (29). In addition, reductions in breast cancer cell migration and invasion were observed after supplementation (30) (31). Resveratrol growth factor heregulin-beta1 (HRG-beta1) mediated matrix metallopeptidase 9 (MMP-9) expressions in human breast cancer cells (30). However, contradictory data show that resveratrol mimics phytoestrogens and could activate genes that are normally regulated by estrogens (18) or androgens (19). In other studies resveratrol helped reduce prostate tumorigenesis through a reduction in prostatic levels of mTOR complex 1 (mTORC1) activity and increased expression of SIRT1 (32); and modulated steroid hormone-dependent pathways to inhibit prostate cancer cell growth. However, it also increases angiogenesis and inhibits apoptosis in vivo (19). Further research is needed. Additional findings show that resveratrol downregulates p21 and upregulates cyclin E leading to S-phase accumulation and apoptosis in neuroblastoma cells (14). It also inhibits CYP1A1, CYP1A2, and CYP1B1 enzymes in tumor cells, perhaps exerting antitumor effects as some of these enzymes are known to be involved in the activation of procarcinogens and toxins (22) (23). Protective effects of resveratrol against doxorubicin-induced cardiotoxicity are due to upregulation of SIRT1-mediated p53 deacetylation (20). Also, it protects against cisplatin-induced cardiotoxicity by suppressing oxidative stress (19). Patients with hormone-sensitive cancers should use caution, as resveratrol—at concentrations between 3 and 10 μM, similar to those needed for its other biological effects—exhibits estrogen-like properties and activates transcription by both estrogen and androgen receptors that lead to the stimulation of cancer cell proliferation (18). Mild to moderate gastrointestinal symptoms and diarrhea at high doses (2.5 and 5 g daily) (27) (33). Antiplatelet drugs: Although clinical relevance is yet to be determined, resveratrol inhibits platelet aggregation in vitro, so concurrent use with antiplatelet drugs may increase bleeding risk (70) (71). Therefore, use of this supplement should be discussed with the treating physician. Cytochrome P450 substrates: Resveratrol inhibited CYP3A4, CYP2D6, CYP2C9, and induced CYP1A2 in healthy volunteers following daily intake of one gram of resveratrol for 4 weeks. Therefore, it can affect the levels of drugs that are metabolized by these enzymes (39). Carbamazepine: Polygonum cuspidatum, an herbal supplement rich in resveratrol, increased carbamazepine blood levels due to CYP3A inhibition and multidrug resistance-associated protein 2 (MRP 2) in a murine model (40). Clinical relevance is yet to be determined. Hall SS. Longevity research. In vino vitalis? Compounds activate life-extending genes. Science. Aug 29 2003;301(5637):1165. Howitz KT, Bitterman KJ, Cohen HY, et al. Small molecule activators of sirtuins extend Saccharomyces cerevisiae lifespan. Nature. Sep 11 2003;425(6954):191-196. Fauconneau B, Waffo-Teguo P, Huguet F, et al. Comparative study of radical scavenger and antioxidant properties of phenolic compounds from Vitis vinifera cell cultures using in vitro tests. Life Sci. 1997;61(21):2103-2110. Pace-Asciak CR, Hahn S, Diamandis EP, et al. The red wine phenolics trans-resveratrol and quercetin block human platelet aggregation and eicosanoid synthesis: implications for protection against coronary heart disease. Clin Chim Acta. Mar 31 1995;235(2):207-219. Tome-Carneiro J, Gonzalvez M, Larrosa M, et al. One-year consumption of a grape nutraceutical containing resveratrol improves the inflammatory and fibrinolytic status of patients in primary prevention of cardiovascular disease. Am J Cardiol. Aug 1 2012;110(3):356-363. Zamora-Ros R, Urpi-Sarda M, Lamuela-Raventos RM, et al. High urinary levels of resveratrol metabolites are associated with a reduction in the prevalence of cardiovascular risk factors in high-risk patients. Pharmacol Res. Jun 2012;65(6):615-620. Kennedy DO, Wightman EL, Reay JL, et al. Effects of resveratrol on cerebral blood flow variables and cognitive performance in humans: a double-blind, placebo-controlled, crossover investigation. Am J Clin Nutr. Jun 2010;91(6):1590-1597. Wong RH, Howe PR, Buckley JD, et al. Acute resveratrol supplementation improves flow-mediated dilatation in overweight/obese individuals with mildly elevated blood pressure. Nutr Metab Cardiovasc Dis. Nov 2011;21(11):851-856. Magyar K, Halmosi R, Palfi A, et al. Cardioprotection by resveratrol: A human clinical trial in patients with stable coronary artery disease. Clin Hemorheol Microcirc. 2012;50(3):179-187. Brasnyo P, Molnar GA, Mohas M, et al. Resveratrol improves insulin sensitivity, reduces oxidative stress and activates the Akt pathway in type 2 diabetic patients. Br J Nutr. Aug 2011;106(3):383-389. Crandall JP, Oram V, Trandafirescu G, et al. Pilot study of resveratrol in older adults with impaired glucose tolerance. J Gerontol A Biol Sci Med Sci. Dec 2012;67(12):1307-1312. Timmers S, Konings E, Bilet L, et al. Calorie restriction-like effects of 30 days of resveratrol supplementation on energy metabolism and metabolic profile in obese humans. Cell Metab. Nov 2 2011;14(5):612-622. Poulsen MM, Vestergaard PF, Clasen BF, et al. High-dose resveratrol supplementation in obese men: An investigator-initiated, randomized, placebo-controlled clinical trial of substrate metabolism, insulin sensitivity, and body composition. Diabetes. 2013 Apr;62(4):1186-95. Chen Y, Tseng SH, Lai HS, et al. Resveratrol-induced cellular apoptosis and cell cycle arrest in neuroblastoma cells and antitumor effects on neuroblastoma in mice. Surgery. Jul 2004;136(1):57-66. ElAttar TM, Virji AS. Modulating effect of resveratrol and quercetin on oral cancer cell growth and proliferation. Anticancer Drugs. Feb 1999;10(2):187-193. Lu R, Serrero G. Resveratrol, a natural product derived from grape, exhibits antiestrogenic activity and inhibits the growth of human breast cancer cells. J Cell Physiol. Jun 1999;179(3):297-304. Surh YJ, Hurh YJ, Kang JY, et al. Resveratrol, an antioxidant present in red wine, induces apoptosis in human promyelocytic leukemia (HL-60) cells. Cancer Lett. Jun 1 1999;140(1-2):1-10. Gehm BD, McAndrews JM, Chien PY, et al. Resveratrol, a polyphenolic compound found in grapes and wine, is an agonist for the estrogen receptor. Proc Natl Acad Sci U S A. Dec 9 1997;94(25):14138-14143. Wang TT, Hudson TS, Wang TC, et al. Differential effects of resveratrol on androgen-responsive LNCaP human prostate cancer cells in vitro and in vivo. Carcinogenesis. Oct 2008;29(10):2001-2010. Zhang C, Feng Y, Qu S, et al. Resveratrol attenuates doxorubicin-induced cardiomyocyte apoptosis in mice through SIRT1-mediated deacetylation of p53. Cardiovascular Research. Jun 1 2011;90(3):538-545. Fabbrocini G, Staibano S, De Rosa G, et al. Resveratrol-containing gel for the treatment of acne vulgaris: A single-blind, vehicle-controlled, pilot study. Am J Clin Dermatol. Apr 1 2011;12(2):133-141. Chen ZH, Hurh YJ, Na HK, et al. Resveratrol inhibits TCDD-induced expression of CYP1A1 and CYP1B1 and catechol estrogen-mediated oxidative DNA damage in cultured human mammary epithelial cells. Carcinogenesis. Oct 2004;25(10):2005-2013. Liu J, Wang Q, Wu DC, et al. Differential regulation of CYP1A1 and CYP1B1 expression in resveratrol-treated human medulloblastoma cells. Neurosci Lett. Jun 17 2004;363(3):257-261. Gresele P, Pignatelli P, Guglielmini G, et al. Resveratrol, at concentrations attainable with moderate wine consumption, stimulates human platelet nitric oxide production. J Nutr. Sep 2008;138(9):1602-1608. Huang PH, Chen YH, Tsai HY, et al. Intake of red wine increases the number and functional capacity of circulating endothelial progenitor cells by enhancing nitric oxide bioavailability. Arterioscler Thromb Vasc Biol. Apr 2010;30(4):869-877. Jang M, Cai L, Udeani GO, et al. Cancer chemopreventive activity of resveratrol, a natural product derived from grapes. Science. Jan 10 1997;275(5297):218-220. Brown VA, Patel KR, Viskaduraki M, et al. Repeat dose study of the cancer chemopreventive agent resveratrol in healthy volunteers: safety, pharmacokinetics, and effect on the insulin-like growth factor axis. Cancer Res. Nov 15 2010;70(22):9003-9011. Gertz M, Nguyen GT, Fischer F, et al. A molecular mechanism for direct sirtuin activation by resveratrol. PloS One. 2012;7(11):e49761. Zhu W, Qin W, Zhang K, et al. Trans-resveratrol alters mammary promoter hypermethylation in women at increased risk for breast cancer. Nutr Cancer. Apr 2012;64(3):393-400. Tang FY, Chiang EP, Sun YC. Resveratrol inhibits heregulin-beta1-mediated matrix metalloproteinase-9 expression and cell invasion in human breast cancer cells. J Nutr Biochem. May 2008;19(5):287-294. Tang FY, Su YC, Chen NC, et al. Resveratrol inhibits migration and invasion of human breast-cancer cells. Mol Nutr Food Res. Jun 2008;52(6):683-691. Li G, Rivas P, Bedolla R, et al. Dietary resveratrol prevents development of high-grade prostatic intraepithelial neoplastic lesions: involvement of SIRT1/S6K axis. Cancer Prev Res. Jan 2013;6(1):27-39.
la Porte C, Voduc N, Zhang G, et al. Steady-State pharmacokinetics and tolerability of trans-resveratrol 2000 mg twice daily with food, quercetin and alcohol (ethanol) in healthy human subjects. Clin Pharmacokinet. Jul 2010;49(7):449-454. Vaz-da-Silva M, Loureiro AI, Falcao A, et al. Effect of food on the pharmacokinetic profile of trans-resveratrol. Int J Clin Pharmacol Ther. Nov 2008;46(11):564-570. Rotches-Ribalta M, Andres-Lacueva C, Estruch R, et al. Pharmacokinetics of resveratrol metabolic profile in healthy humans after moderate consumption of red wine and grape extract tablets. Pharmacol Res. Nov 2012;66(5):375-382. Boocock DJ, Faust GE, Patel KR, et al. Phase I dose escalation pharmacokinetic study in healthy volunteers of resveratrol, a potential cancer chemopreventive agent. Cancer Epidemiol Biomarkers Prev. Jun 2007;16(6):1246-1252. Meng X, Maliakal P, Lu H, et al. Urinary and plasma levels of resveratrol and quercetin in humans, mice, and rats after ingestion of pure compounds and grape juice. J Agric Food Chem. Feb 25 2004;52(4):935-942. Howells LM, Berry DP, Elliott PJ, et al. Phase I randomized, double-blind pilot study of micronized resveratrol (SRT501) in patients with hepatic metastases—safety, pharmacokinetics, and pharmacodynamics. Cancer Prev Res. Sep 2011;4(9):1419-1425. Chow HH, Garland LL, Hsu CH, et al. Resveratrol modulates drug- and carcinogen-metabolizing enzymes in a healthy volunteer study. Cancer Prev Res. Sep 2010;3(9):1168-1175. Chi YC, Lin SP, Hou YC. A new herb-drug interaction of Polygonum cuspidatum, a resveratrol-rich nutraceutical, with carbamazepine in rats. Toxicol Appl Pharmacol. Sep 15 2012;263(3):315-322. Patel KR, Brown VA, Jones DJ, et al. Clinical pharmacology of resveratrol and its metabolites in colorectal cancer patients. Cancer Res. Oct 1 2010;70(19):7392-7399. Semba R, Ferrucci L, Bartali B, et al. Resveratrol levels and all-cause mortality in older community-dwelling adults. JAMA Intern Med. 2014 Jul;174(7):1077-84. Liu K, Zhou R, Wang B, et al. Effect of resveratrol on glucose control and insulin sensitivity: A meta-analysis of 11 randomized controlled trials. Am J Clin Nutr. 2014 Apr 2;99(6):1510-1519. Faghihzadeh F, Adibi P, Hekmatdoost A. The effects of resveratrol supplementation on cardiovascular risk factors in patients with non-alcoholic fatty liver disease: a randomised, double-blind, placebo-controlled study. Br J Nutr. 2015 Sep 14;114(5):796-803. Turner RS, Thomas RG, Craft S, et al. A randomized, double-blind, placebo-controlled trial of resveratrol for Alzheimer disease. Neurology. Oct 20 2015;85(16):1383-1391. Bo S, Ponzo V, Ciccone G, et al. Six months of resveratrol supplementation has no measurable effect in type 2 diabetic patients. A randomized, double blind, placebo-controlled trial. Pharmacol Res. 2016 Sep;111:896-905. Farzaei MH, Rahimi R, Nikfar S, Abdollahi M. Effect of resveratrol on cognitive and memory performance and mood: A meta-analysis of 225 patients. Pharmacol Res. 2018 Feb;128:338-344. Elgebaly A, Radwan IA, AboElnas MM, et al. Resveratrol Supplementation in Patients with Non-Alcoholic Fatty Liver Disease: Systematic Review and Meta-analysis. J Gastrointestin Liver Dis. 2017 Mar;26(1):59-67. Imamura H, Yamaguchi T, Nagayama D, Saiki A, Shirai K, Tatsuno I. Resveratrol Ameliorates Arterial Stiffness Assessed by Cardio-Ankle Vascular Index in Patients With Type 2 Diabetes Mellitus. Int Heart J. 2017 Aug 3;58(4):577-583. Guo D, Xie J, Zhao J, Huang T, Guo X, Song J. Resveratrol protects early brain injury after subarachnoid hemorrhage by activating autophagy and inhibiting apoptosis mediated by the Akt/mTOR pathway. Neuroreport. 2018 Mar 21;29(5):368-379. Huhn S, Beyer F, Zhang R, et al. Effects of resveratrol on memory performance, hippocampus connectivity and microstructure in older adults - A randomized controlled trial. Neuroimage. Jul 1 2018;174:177-190. Anton SD, Ebner N, Dzierzewski JM, et al. Effects of 90 Days of Resveratrol Supplementation on Cognitive Function in Elders: A Pilot Study. J Altern Complement Med. Jul 2018;24(7):725-732. Bo S, Gambino R, Ponzo V, et al. Effects of resveratrol on bone health in type 2 diabetic patients. A double-blind randomized-controlled trial. Nutr Diabetes. Sep 20 2018;8(1):51. Bo S, Togliatto G, Gambino R, et al. Impact of sirtuin-1 expression on H3K56 acetylation and oxidative stress: a double-blind randomized controlled trial with resveratrol supplementation. Acta Diabetol. Apr 2018;55(4):331-340. Khojah HM, Ahmed S, Abdel-Rahman MS, et al. Resveratrol as an effective adjuvant therapy in the management of rheumatoid arthritis: a clinical study. Clin Rheumatol. Aug 2018;37(8):2035-2042. Hussain SA, Marouf BH, Ali ZS, et al. Efficacy and safety of co-administration of resveratrol with meloxicam in patients with knee osteoarthritis: a pilot interventional study. Clin Interv Aging. 2018;13:1621-1630. Fischer N, Seo EJ, Efferth T. Prevention from radiation damage by natural products. Phytomedicine. Aug 1 2018;47:192-200. Carsten RE, Bachand AM, Bailey SM, et al. Resveratrol reduces radiation-induced chromosome aberration frequencies in mouse bone marrow cells. Radiat Res. Jun 2008;169(6):633-638. Xu L, Yang X, Cai J, et al. Resveratrol attenuates radiation-induced salivary gland dysfunction in mice. Laryngoscope. Nov 2013;123(11):E23-29. Zhang H, Yan H, Zhou X, et al. The protective effects of Resveratrol against radiation-induced intestinal injury. BMC Complement Altern Med. Aug 16 2017;17(1):410. Banegas YC, Ocolotobiche EE, Padula G, et al. Evaluation of resveratrol radiomodifying potential for radiotherapy treatment. Mutat Res. Dec 2018;836(Pt B):79-83. Johnson GE, Ivanov VN, Hei TK. Radiosensitization of melanoma cells through combined inhibition of protein regulators of cell survival. Apoptosis. Jun 2008;13(6):790-802. Voellger B, Waldt N, Rupa R, et al. Combined effects of resveratrol and radiation in GH3 and TtT/GF pituitary adenoma cells. J Neurooncol. Jun 5 2018. Prager I, Patties I, Himmelbach K, et al. Dose-dependent short- and long-term effects of ionizing irradiation on neural stem cells in murine hippocampal tissue cultures: neuroprotective potential of resveratrol. Brain Behav. Oct 2016;6(10):e00548. Bhardwaj A, Sethi G, Vadhan-Raj S, et al. Resveratrol inhibits proliferation, induces apoptosis, and overcomes chemoresistance through down-regulation of STAT3 and nuclear factor-kappaB-regulated antiapoptotic and cell survival gene products in human multiple myeloma cells. Blood. Mar 15 2007;109(6):2293-2302. Jazirehi AR, Bonavida B. Resveratrol modifies the expression of apoptotic regulatory proteins and sensitizes non-Hodgkin’s lymphoma and multiple myeloma cell lines to paclitaxel-induced apoptosis. Mol Cancer Ther. Jan 2004;3(1):71-84. Nguyen AV, Martinez M, Stamos MJ, et al. Results of a phase I pilot clinical trial examining the effect of plant-derived resveratrol and grape powder on Wnt pathway target gene expression in colonic mucosa and colon cancer. Cancer Manag Res. Apr 3 2009;1:25-37. Popat R, Plesner T, Davies F, et al. A phase 2 study of SRT501 (resveratrol) with bortezomib for patients with relapsed and or refractory multiple myeloma. Br J Haematol. Mar 2013;160(5):714-717. Bertelli AA, Giovannini L, Giannessi D, et al. Antiplatelet activity of synthetic and natural resveratrol in red wine. Int J Tissue React. 1995;17(1):1-3.